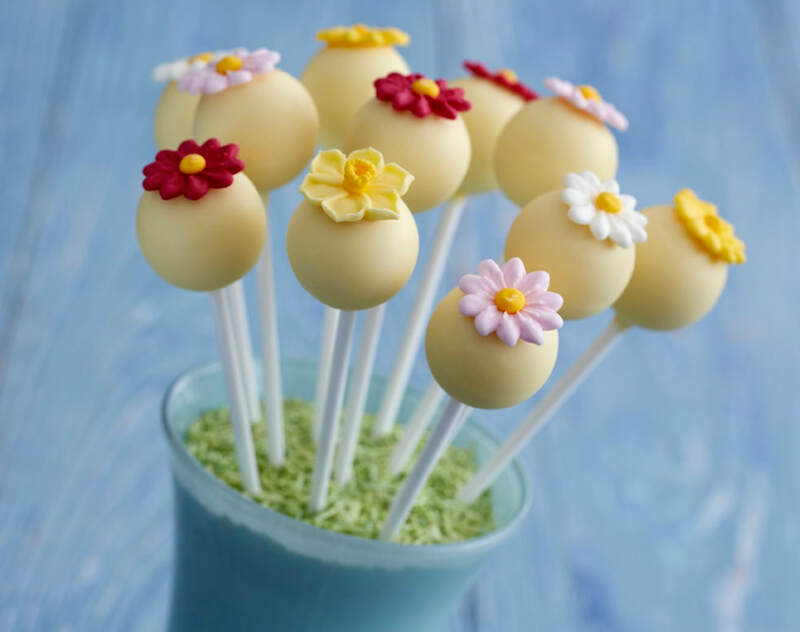 ​​An edible fresh spring bloom, perfect for party favours or as an edible gift to share with friends. Cake Angels Flower Fun Sugar Decorations. 1. ​Cover a baking sheet with baking parchment. 2. Place the chocolate in a heatproof bowl and melt in a microwave on medium checking every 15 seconds or it may burn, stirring occasionally until just melted. 3. Crumble the cake crumbs into the melted chocolate, and stir until well mixed. Wait a few minutes to cool slightly and use a teaspoon to scoop into your hands and roll the mixture into balls approximately 1 ½ inches across. 4. Place a little of the chocolate for the coating in a heatproof bowl and melt in a microwave checking every 10 seconds or it will burn, stirring occasionally until just melted. 1. One at a time, dip each stick about 1/2 inch into the melted chocolate and push the stick halfway into each cake ball, then put on the covered baking sheet and place in the fridge for about 10 minutes to firm up. 2. Melt the remaining chocolate in a heatproof bowl in a microwave on medium checking every 15 seconds or it may burn, stirring occasionally until just melted. 3. Remove the cake pops from the fridge and gently dip each one into the chocolate coating, carefully tapping the stick with your finger to let the excess chocolate drip back into the bowl. 4. Insert upright into a polystyrene block or place carefully into a glass or empty jam jar taking care not to touch the chocolate . 5. Apply your Cake Angels Flower Fun Sugar Decorations before the chocolate sets. 6. Place somewhere cool, but not the fridge, and leave for 15 - 20 minutes or until the chocolate has set. 7. Display in a small vase or decorative plant pot using granulated sugar to hold the cake pops in place. When happy with your arrangement cover the top of the sugar with green sprinkles.